Summary and Definition: The Interstate Commerce Act was passed by Congress on February 4, 1887 to address the cost of freight-shipping on the railroads. The Interstate Commerce Act created an Interstate Commerce Commission to oversee the conduct of the railroad industry. The law was in response to public demand that the monopolies of the railroad companies and their operations be regulated. 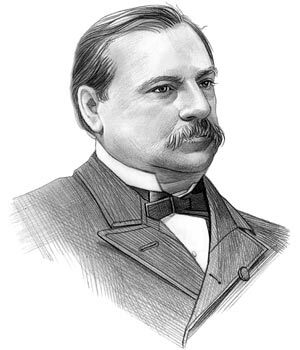 Grover Cleveland was the 22nd and 24th American President who served in office from March 4, 1885 to March 4, 1889 and from March 4, 1983 - March 4,1897. One of the important events during his presidency was the Interstate Commerce Act. The Interstate Commerce Act was passed in response to the public outcry against the dubious practices of the Railroad Companies. It was the time in US history when wealthy 'Robber Barons' took control of industries sparking protests from workers that resulted in strikes in the towns and cities during the Industrial Revolution. For additional facts refer to the Rise of Big Business and Corporations. Railroad magnates and industrialists like Edward Harriman, Charles Crocker, Cornelius Vanderbilt, Leland Stanford, Henry Bradley Plant and Mark Hopkins had gained monopolies over the railroad industry and were referred to as 'Robber Barons'. The Robber Barons had control of the railroads and the transportation of grain crops from the local farmers to distant markets. The steam-powered Grain Elevators had been financed by the railroads and the "Prairie Skyscrapers" were located every 10 miles at the railroad terminals. The Grain elevator operators bought the grain from farmers and many used their purchasing power to control prices. The farmers established a coalition of U.S. farmers, referred to as the Granger movement. The Granger movement was supported by the farmers of Iowa, Nebraska, Kansas, Minnesota, and the Dakotas. 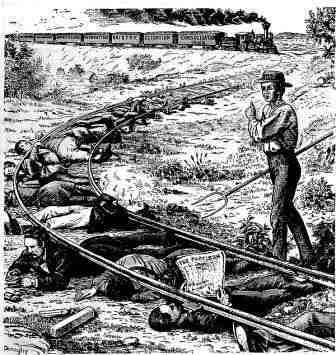 The Grangers used their cooperative system to challenge the monopolies of the railroad companies and their unfair practices in relation to grain prices and shipping costs. The members of the Granger Movement significantly increased following the Panic of 1873, falling crop prices and increased shipping rates. The Grangers applied political pressure and in some states "Granger Laws" were passed to give legislative assistance to the farmers. Interstate Commerce Act for kids: The "Granger Laws"
The 'Granger Laws' established state railroad commissions legislation covering the operation of grain elevators and set maximum railroad rates. The Railroad Companies were incensed and challenged the Granger Laws. A number of these state laws were undermined by the 1886 Wabash, St. Louis & Pacific R.R. Co. v. Illinois decision of the Supreme Court of the United States. The Wabash decision declared that states could not regulate any commerce that went outside their borders. However, the U.S. Supreme Court, in Munn v. Illinois (1876), established that public regulation of private utilities for public use was constitutional. This ruling led to demands for national legislation and the Interstate Commerce Act was passed in 1887. The Interstate Commerce Act established the first true federal regulatory agency. The railroads were privately owned and operated and were not regulated. The railroads had become a major means of interstate commerce, involving the transportation of goods across state borders. Railroad companies discriminated in the prices they charged to passengers and shippers in different localities by providing rebates to large shippers or buyers - the small farmers could never qualify. Railroad monopolies were being formed due to lack of competition (Monopolies occur when one company or individual is the only provider of a particular service or product). Without any form of regulation or control the private railroad companies were able to implement operations and prices of their choosing. Interstate commerce needed to be regulated across all of the states. Purpose of the Interstate Commerce Act: The law required that Shipping rates had to be "reasonable and just"
The Interstate Commerce Act established the Interstate Commerce Commission (ICC) as the first true federal regulatory agency. Although the law granted the ICC the power to investigate abuses and summon witnesses, it lacked the resources to accomplish its goals. Later administrations ensured that reform would not go too far, by appointing pro-railroad commissioners. It would take another 20 years before the Interstate Commerce Act was strengthened by Congress. For additional facts refer to the Mann-Elkins Act. The article on the Interstate Commerce Act provides detailed facts and a summary of one of the important events during his presidential term in office. The following Grover Cleveland video will give you additional important facts and dates about the political events experienced by the 22nd and 24th President of the United States whose presidencies spanned from March 4, 1885 to March 4, 1889 and from March 4, 1983 - March 4,1897.